Madeline Behrens-Brigham doesn't like New Year's resolutions. They're too oppressive, she says, and thus almost always predestined to fail. She prefers affirmations. An affirmation, says the San Francisco artist, "is not about what one doesn't want. It's about what is possible." 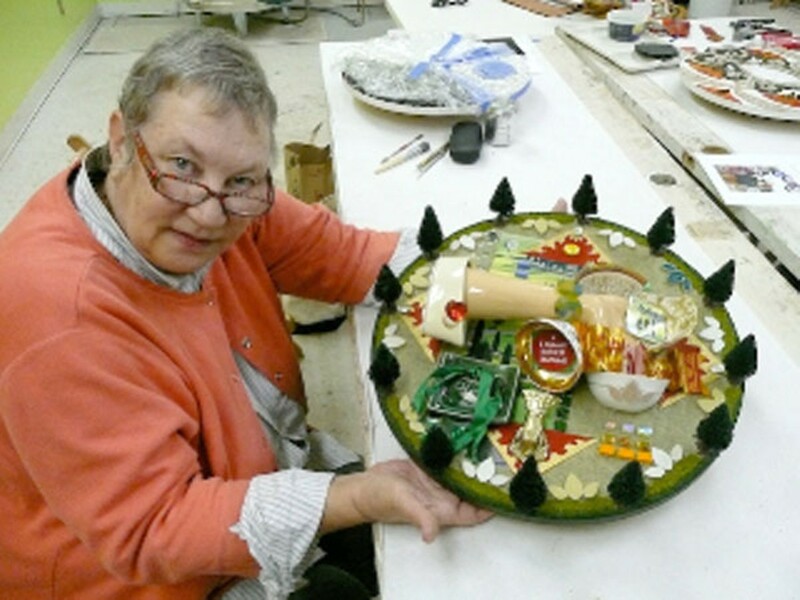 At the Institute of Mosaic Art (3001 Chapman St., Oakland) on Saturday, January 2, she's leading an all-day class in creating mixed-media assemblages that reflect their makers' affirmations. The act of creating such pieces — attaching bits and bobs to a surface and to each other — renders the hopes and dreams behind them more real. If you've gone to the effort of selecting materials, designing a finished creation, and putting it together, then you've made a commitment. You've taken the first step. "Just saying or reading affirmations is one thing," Behrens-Brigham says. "But turning them into a visual image helps you focus your thoughts on them. It's a meditation tool." The class began as a personal experiment. "I used to have a large studio, and on New Year's Day there's never a lot to do. Most places are closed, so one year I thought it would be nice to get together with other artists" and make pieces to provide inspiration throughout the coming year, she explains. One of those who took part was Institute of Mosaic Art director Laurel True. The two women decided to make an annual tradition of it. Behrens-Brigham starts each class with icebreaking exercises to guide participants toward those inner spaces where hopes and dreams reside. "It becomes lively as people start talking about things they're passionate about," she says. "Ideas evolve as we talk." Using items they've brought along themselves, participants also choose from a wealth of components on offer at the institute: fabric, bric-a-brac, glitter, mirror, tiles, and more. Having spent childhood summers on her grandparents' Midwestern farm, Behrens-Brigham draws profound inspiration from what others would call scraps. On the farm, "everything was reused in some way. The button jar is a fond memory. I encourage people to use what is around us rather than buying pre-made materials" such as scrapbooking supplies. Some of the most interesting assemblages reflect wishes — unplanned affirmations — that the creators weren't aware they even had: "People start following what they're attracted to. They look for those signals. They look for those signs. Then they see where that leads," Behrens-Brigham says. For example, one year she felt inexplicably compelled to affix buttons and spools of thread to her assemblage. Within a few months, her career path shifted as she found herself focusing more than ever on textile art. These days, she specializes in patchwork pillows.